We’re frequently asked by clients to provide a copy of their logo in JPG format and our response is typically "exactly where’s the logo being used and how big will it be", because basically there are different formats and sizes for different applications. 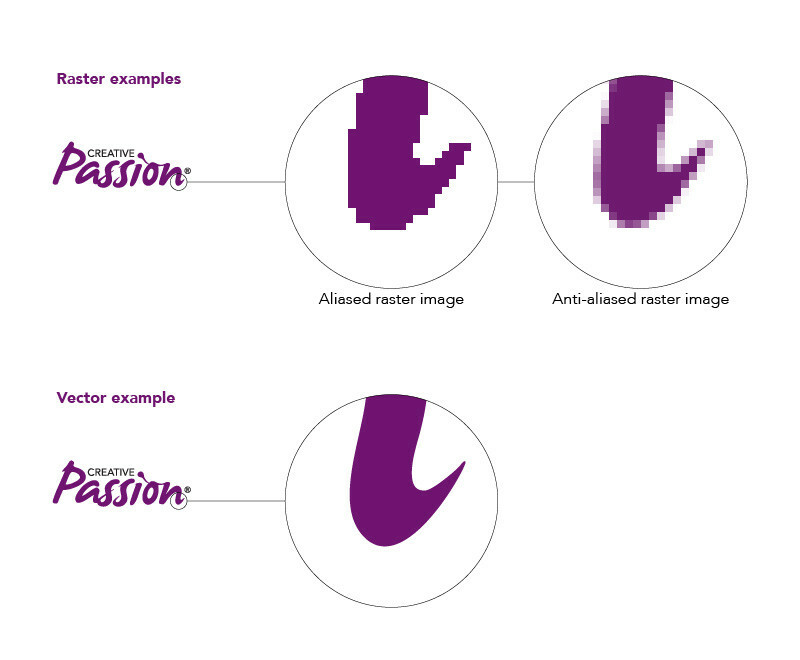 The most common raster images are photos, and they’re made of numerous dots called pixels. Standard raster formats include JPG, TIF, BMP, PSD, PNG and GIF. If you need your logo for a website or other onscreen purpose, then a JPG might be suitable, but PNG or GIF format might be better (we’ll have to cover that in a future article). Below is a JPG version of our logo which is only 72 dpi, and when used at this particular size on a website it’s perfectly fine. If you look at the inset, you can see the separate pixels. So if this particular JPG was printed 1 metre wide for a banner at a tradeshow, it would look dreadful. See the section on vector images below. If it were used in an advertisement on a cinema screen then it would also look terrible, because it hasn’t been created at the size and resolution to suit that application. Logos and fonts are typically vector (or at least the original artwork should be), and this is ideal for signage and printing. Formats like Encapsulated Postscript (EPS), Adobe Illustrator (AI) and Portable Document Format (PDF) are vector when drawn properly. Let me explain the difference. You can open a photo (which is made of raster pixels) in Photoshop or Acrobat and save it as an EPS. And while this is an EPS file, it’s just an EPS file with a raster image saved within it. A proper vector image however is made of lines and curves. And so if it’s drawn properly, it should theoretically be able to be enlarged to any size, and still look perfect. The only limitation is the quality of the substrate and the printer producing the piece. So if you need professional designers who can design and provide your logo in suitable formats, call Creative Passion on (07) 3366 8166.